Step 1: Send us a photo sample and get approved. Step 2: Find suitable large surfaces and take 100-200 photos of it. Step 3: Once accepted, get paid anywhere from $60-160 depending on the size and quality (pricing chart below). We are Poliigon - a site that offers textures for 3D artists to use in their virtual environments. You may have already seen our textures in movies and video games, created by the many studios that use our content. Because 3D artists make a variety of environments, we need lots of different surface captures. Like brick, dirt, tree bark, etc. Which is why we're opening our library to submissions! So read on to see how you can earn to $160 p/hr. The following is a list of guidelines for taking photos. You can also download our printable checklist to take with you on shoots. Why overcast? When the sky is cloudy, the light is the softest. 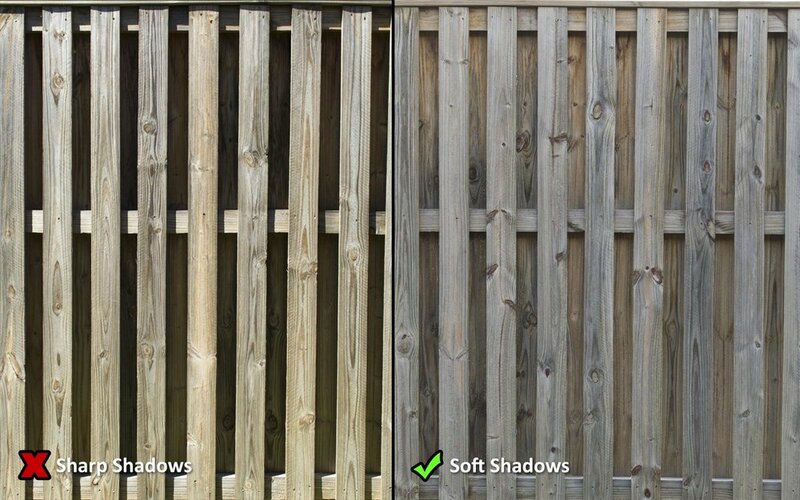 This is crucial, because sharp dark shadows (seen on sunny days) ruin textures! So the best time to shoot is on a cloudy day. Alternatively, if it's never cloudy where you live, you can wait for the sun to go down enough that the ground is entirely in uniform shadow. The only problem with this is that because it's typically at sunrise or sunset, the light changes quickly! So you'll need to photograph it relatively fast. Take a browse of our surface wishlist to see what we're wanting to purchase. Large: Minimum of 2x2m (7x7ft). Larger scans are entitled to even more money. Uniformly lit: No shadows from trees or other objects nearby. Repetitive: We require that every surface is fairly repetitive. So avoid anything with an identifiable one off object. Eg. A large rock in an otherwise bare patch of dirt. Shutter speed: At least 1/80, preferrably 1/150. The higher, the faster your shutter, and therefore the less motion blur in each photo. F-stop: At least of f10. This will ensure that the entire surface is in focus. Blur ruins photos, which is why this is important. ISO: Maximum of 400 for an entry level camera, and up to 1600 for a high-end camera. Exposure: After following the settings above, point at the surface and check that the exposure falls in the suitable range. Zoom: Max 50mm. Once set, lock it! If the lens moves during photographing, the batch may be rejected. So don't change it. Polarisation: If you have a polarisation filter (+$20 extra per surface capture if you do!) rotate it, so that the reflection is eliminated. Step 5: Photograph it in rows. Half-press the shutter to focus on the ground. Holding very still, full-press to take the photo. Take a half-step to the right or left, and take another photo. Ideally you should have at least 70% overlap from the previous photo. Repeat this till you reach one end of the surface. Then take a half-step down and repeat in the opposite direction. Continue until the entire surface is photographed. Step 6: Capture reference photos. Take one photograph of the entire surface (usually a few steps back, from an angle). Point facing towards the light source (if sun is overhead anywhere is fine), then get low and photograph it an angle towards the light. This is to show us what the reflection of the surface is. Optional: If you have an Xrite ColorChecker (+ $20 bonus per surface if you do!) place it on the surface and capture it so it fills about 70% of the frame. Step 7: Submit it for review. Convert all your RAW photos to JPG, level 9, (but keep RAW files for later) using software like Lightroom. Upload the JPGs to one folder of Dropbox, or Google Drive. Send the link using this form. Your photos will be reviewed for accuracy, and you'll receive a reply within 3-5 days. If approved, you'll be asked for the RAW files. Once we've received the RAW files, you'll be sent anywhere from $60-160 depending on the pay scale below. Average: The minimum acceptable level of photo quality. Best: ALL of the above traits.